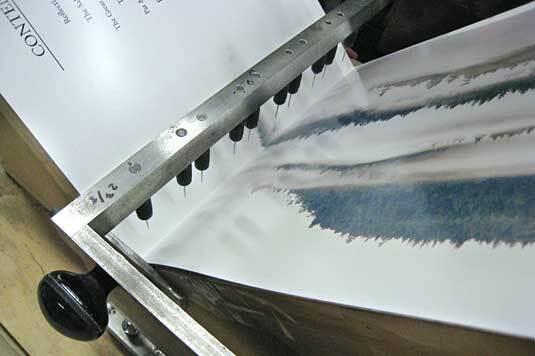 The binding of the first copies of LABYRINTH SUBLIME is well underway at Felton Bookbinding. There is much going on at the bindery and simultaneously at Friesens where we’re yet in the prototype stage for the presentation boxes. For today’s update, we’ll focus specifically on the hand-sewing and the linen thread and tapes. Hand sewing is almost never done any more on a production scale, due to expense. 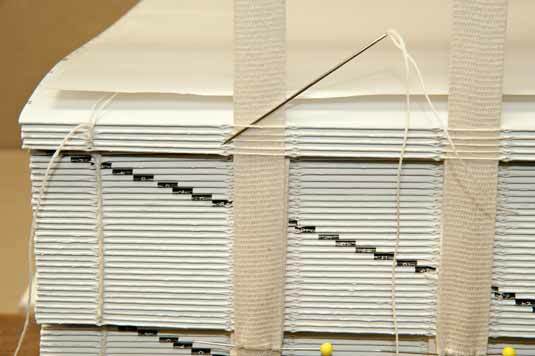 Modern machines can sew books in a matter of seconds, using smooth, synthetic threads that feed swiftly through needle eyes. Neither this process nor the materials are applicable when longevity and strength are paramount, or when books are quite heavy. For ANTARCTICA and LABYRINTH SUBLIME, the pages of each being nearly 20 pounds in weight, we selected the age-old tradition of hand sewing with linen thread which results in stitches and knots that are very strong and archival. Our objective is to do all that we can to ensure the sewing will hold through centuries of use. The sewing process starts with piercing of holes along the crease of folded pages in the exact placement where the sewing is to be. Keith Felton designed a jig and a hand-operated guillotine for this purpose. Ten needles, identical to those used for the hand sewing, are mounted on the guillotine arm. 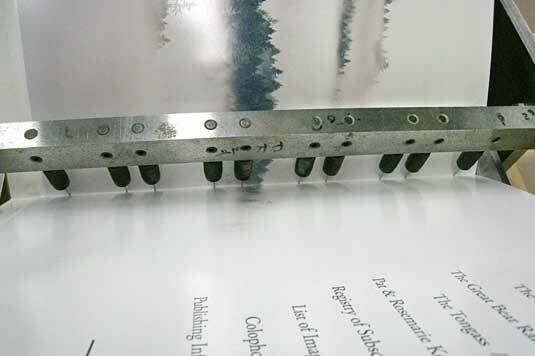 When plunged into the paper, the needles cleanly and consistently pierce 10 corresponding holes through the fold. So that the holes are clean with no shatters, gaps, tears, or other imperfections, just one thickness of page is pierced at a time. For the same reason, the needles are changed frequently, long before they dull. In ancient times book pages were sewn on thongs made from vellum (finely processed calf-skin), then on cords of leather or twine. An innovation that combined strength, less bulk, and added elegance was developed by hand-sewing pages onto finely woven, cloth tapes milled from Irish linen. For our tomes, we have specified four linen tapes, each 3/4" wide. 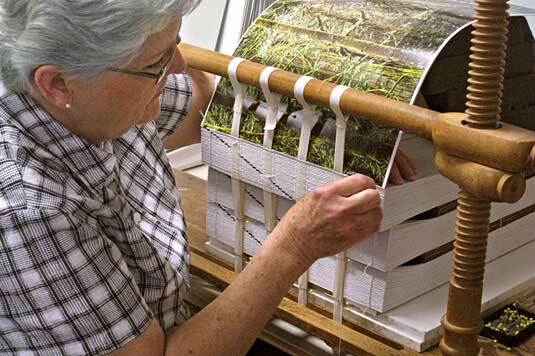 These tapes are stretched under tension on Jacqueline and Joan’s sewing frames. Mounting one signature at a time under the sewing frame, (our 29 signatures each being 12-page sections — 3 x 4 pages nested together), the women feed their sharp needles in and out of the pre-pierced holes. As they sew, they also weave their thread about the linen tapes drawing them tight to the spine. Thus when looking at a finished book, five stitches are visible at the centre of each of the signatures; while hidden along outside of the spine are four stitches about the linen tapes at either end of which are two specialized knots called kettle stitches that anchor the signatures tightly together. The kettle stitch is thus a knot that links signatures together in a chain-like fashion. You can see the kettle stitches anchoring the sewing at left side of LABYRINTH SUBLIME in this photo. The right side would look the same. Clearly you can see the thread woven about the binder’s tapes. Both ANTARCTICA and LABYRINTH SUBLIME are sewn with traditional, heavy-weight, Irish linen thread, considered to be the highest quality binder’s thread. Barbour Threads from Lisburn, Northern Ireland have been sourced through J. Hewit and Sons, whom you’ll recall as our leather tannery (thank you Hewit for the two product photos that follow). 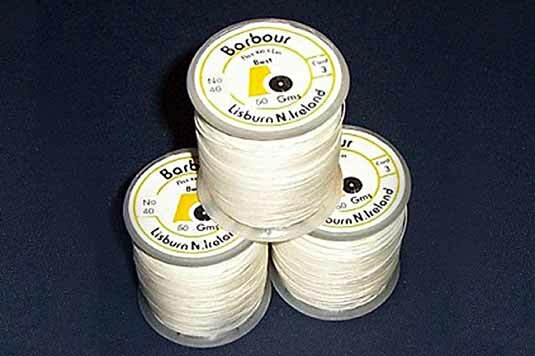 Barbour had its beginnings in 1784 and became an international company a century later, quickly growing to be the world’s largest thread mill producing quality linen thread for fine fabrics as well as utility cord for fishing nets and twine. Linen thread is exceptionally strong and is archival. Unlike man-made fibers, linen thread will not stretch nor loosen through time, despite being flexible from the outset — desirable characteristics for book sewing. In fact, linen fibre and cloth become even stronger when wet which is why linen was the preferred sail cloth used by mariners and the British Admiralty during the age of sail; and by housewives for dish cloths. So common was linen used for dish cloths and bedding that these household items collectively became known as linens .... called this even today despite often being made from less costly cotton or synthetic-blends. For our tomes, Felton uses a 25/3 linen thread — 3 strands of 25 gauge spun together to make the one thicker thread. To determine this specific thread, much testing and evaluation was done during the prototype stage for ANTARCTICA a decade ago using different gauges, number of strands, and number of twists in each strand of the linen thread. Nothing was left to chance as these variables have a bearing upon the bulk in spine as well as the overall strength of the book. What is not well known is that linen is woven from the humble flax, a very useful plant that was once grown in great quantity in Northern Ireland. This is the same blue-flowered plant from which omega-3 rich flax oil, a noted dietary supplement, is cold-pressed, and from which are harvested healthy little flax seeds that we should all add to our breakfast cereals. The fiber is extracted from the stalk of the flax plant and is used not only for speciality book binding thread, but more commonly as a raw material for the high-quality paper industry for the use of printed banknotes, and for high quality linen fabrics such as intricate damasks and lace. To add to the flax trivia... Rosemarie well remembers the heavy smell of linseed oil paints used in the houses her dad built during those days prior to water-based latex paints. And for centuries linseed oil (from flax seeds) was used as a drying oil in varnishes as well as paints used by the masters on their canvasses which were also woven from linen. Although Ireland has over 300 years of heritage concerning the manufacture of Irish Linen with an estimated 40% of the working population dependant on the linen industry at the beginning of the 20th century, by the close of the same century only 10 significant companies remained employing some 4,000 people. Today, just over a decade later, the industry has shrunk further, and has shifted almost entirely to the luxury and custom boutique market; linen production and milling from India and Russia having supplanted the price-sensitive market. The linen tapes (above) used in the sewing of LABYRINTH SUBLIME are milled in the United Kingdom. When Jacqueline and Joan sew our book blocks, they leave a tail of the tape extending several inches in length on either side. We can pick up the book blocks simply by holding the ends of these tapes. The long ends of the tapes are later permanently sandwiched between the laminations of binder boards that make up the hard covers, becoming one integral unit. 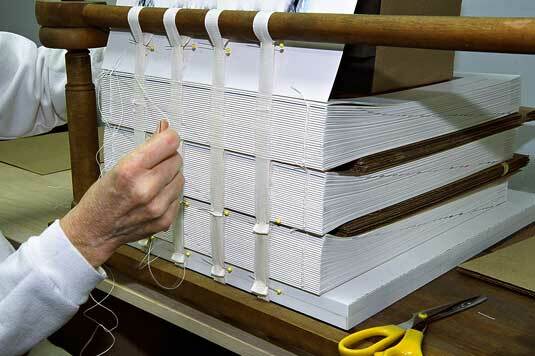 This is the split-board binding technique which transfers the support of the weight of the pages securely within the book covers. This is quite different from another binding style of gluing the tapes to the surface of the cover boards and then covering boards and tapes with a decorative material — a style of far lessor strength. More on the split-board binding and the Classic European style of leather binding to come in the next update!